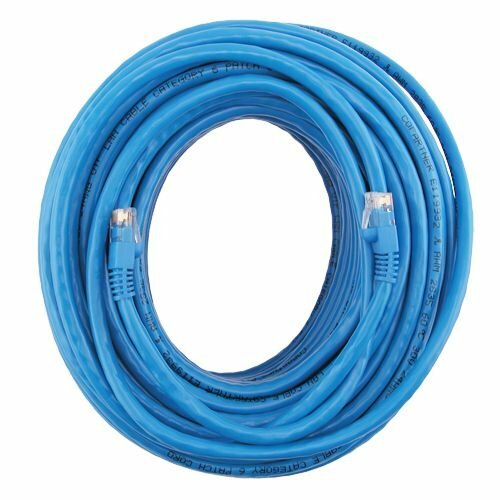 Ethernet Cable CAT6 - 100 FT / 30.48 M, Blue: This CAT6 ethernet cable connects all the hardware destinations on a gigabit Local Area Network. Snag-less molded strain relief. Cable's RJ45 tap is protected from being damaged during installation. Features 50 micron gold plated RJ45 (male-to-male) connectors which ensure clear transmission. Support 10, 100 and 1000 Base-T networks. RiteAV - Cat6 Network Ethernet Cable - Blue - 5 ft.
RiteAV - Cat6 Network Ethernet Cable - Blue - 25 ft.